Prime Minister Netanyahu and President Trump met yesterday. There are many things to unpack from the first meeting of these two world leaders. Here are some takeaways from a few of the issues that were covered, following their short press conference. Members of Netanyahu’s own coalition warned him not to mention a two-state solution in his talks with President Trump. They warned him the “earth would shake” if he supported a Palestinian state, a concept he has supported—though tenuously—since 2009. Netanyahu’s biggest threat these days does not come from the Palestinians, the Iranians or the UN Security Council, but rather from the Israeli right. He needs them to keep his coalition in place, and he no longer enjoys the bogeyman that was President Obama. With an overtly friendly American president—the first Republican in the White House concurrently with Netanyahu’s long reign—placing international blame elsewhere will be much harder to accomplish. Bibi seems to understand that Trump, due to his unpredictability, is not a man to be trifled with. Trump speaks (shallowly) of his love of the Jewish state, but he is unlikely to remain silent if he feels that Netanyahu is embarrassing or undermining him. It’s not hard to imagine an early morning tweet storm from @RealDonaldTrump or @POTUS literally leading to new elections in Israel. 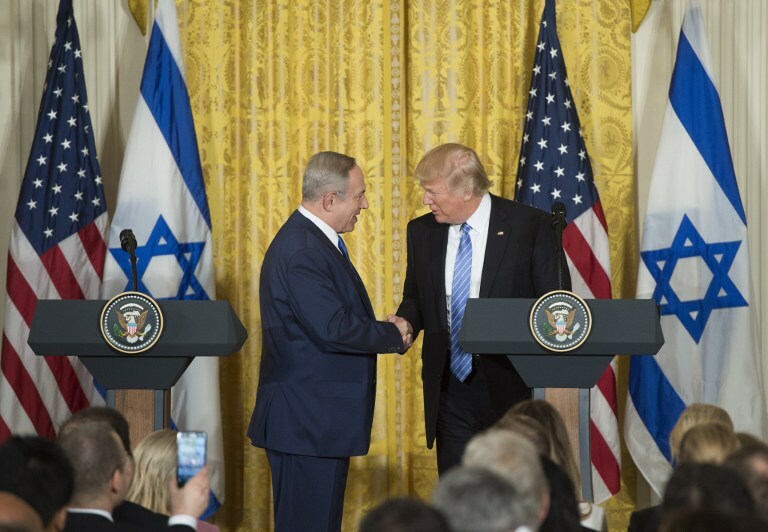 President Trump undermined decades of American foreign policy on the Israeli-Palestinian conflict, when he declared “I’m looking at two-state and at one-state, and I like the one that both parties like.” This is a fine concept for a neutral party, but Trump is now representing generations of diplomatic efforts aimed specifically at creating a two-state solution to the conflict. President Trump, new to government and diplomacy, still doesn’t seem to understand the weight of his words as they relate to American foreign policy. Why would Israel hold back on settlements if they weren’t an obstacle to peace? A good answer did not emerge from the remarks or the Q & A that followed. When Trump was asked by an Israeli reporter what he would say to those in the Jewish community who “believe and feel that your administration is playing with xenophobia and maybe racist tones,” he responded by bragging about his electoral college victory. Candidate Trump promised to move the American embassy to Jerusalem. It is an easy promise to make, a far harder one to fulfill. Such a move might give Bibi some positive talking points with his rightward flank back home, but in the long run it would cost him more political capital with America than he is probably prepared to accept. And it is hard to imagine such a move not leading directly to bloodshed. Trump purportedly had plans to make the U.S. Embassy move his first act as President. Literally. He allegedly planned to declare a directive to move the embassy at 12:01 on Inauguration Day. But he was seemingly convinced of the broader political ramifications of this choice and opted instead to push off the decision, like many of his predecessors before him. For a straight shooter who has proven himself to mix things up quickly and sometimes without foresight, it is interesting to see him moderate this particular campaign promise. It is also promising that he understands—for now anyway—that if he wants to be remembered for brokering “the ultimate deal,” he can’t simply do anything he pleases in the build-up. Prime Minister Netanyahu has a long history of demanding the Palestinians drop all pre-conditions to direct negations while simultaneously setting forth several of his own. 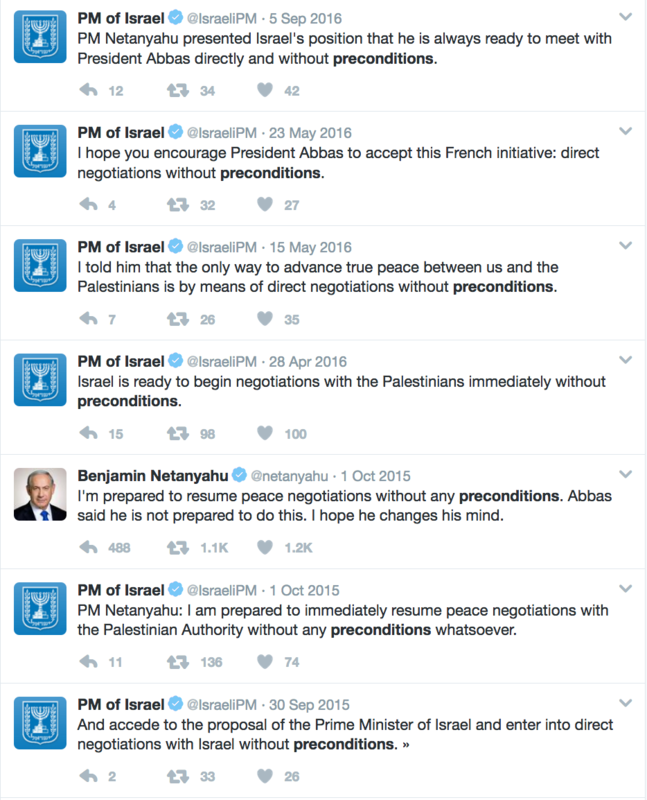 A quick Twitter search of @Netanyahu and @IsraeliPM finds over a dozen tweets stating that preconditions are impediments to peace and that he is prepared to come to the negotiating table, so long as there are no Palestinian preconditions in place. 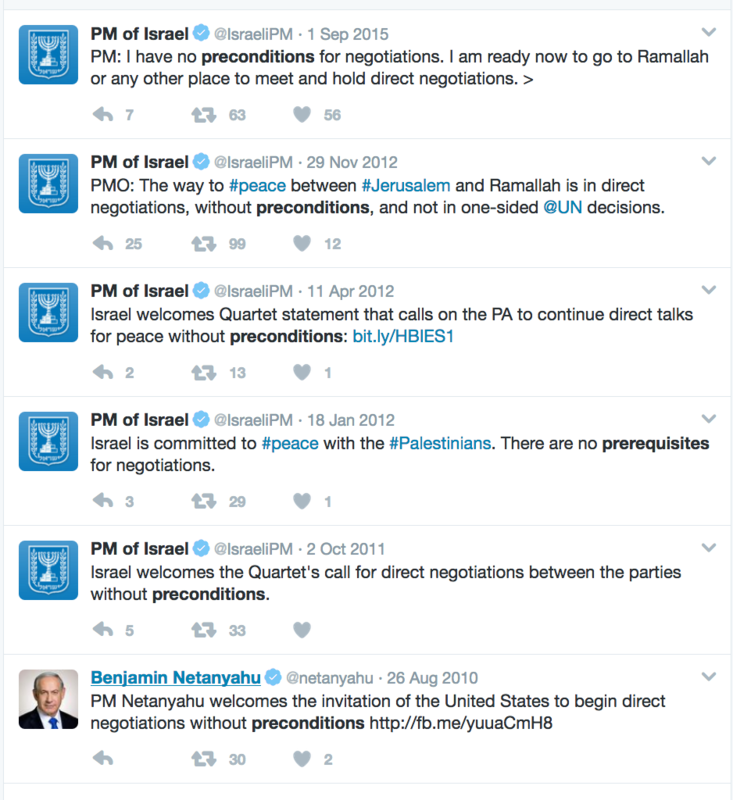 The first will always be a deal breaker for the Palestinians. While they have long recognized Israel’s legitimacy as a state, 20% of the population of Israel is Palestinian. President Abbas isn’t going to recognize Israel as a Jewish state any sooner than the U.S. is going to recognize Taiwan as the legitimate seat of the Chinese state. The second “prerequisite” is likely to be attained, but only within the confines of a grander peace deal. Why would the Palestinians acquiesce on the right to retain security control over their new state without receiving something in return from Israel? The very concept of preconditions declare that the issue is not up for negotiation—neutralizing it down the road as a bargaining chip. The Palestinians won’t cede this chip in advance, just like Bibi will not accept preconditions on Jerusalem, the Palestinian Right of Return or settlement expansion. And Bibi knows it. But his language allows him to talk about peace on the world stage while also ensuring that no progress is actually possible. Netanyahu is well on his way to becoming the longest-serving Prime Minister in Israel’s history. He has shown again and again that he will do anything in order to retain that seat. But really, Netanyahu is not so much Israel’s bold leader as he is a somewhat powerful member of the ruling coalition, working desperately to keep it from falling apart. Trump threw a few barbs and Netanyahu weathered them. But he also got to stand on the stage as Trump—purposefully or inadvertently—changed America’s longstanding policy regarding the two-state solution. All in all, this was a good trip for Netanyahu: he can go home with some breathing room from his own conservative wing. At least for a little while.